It remains to be seen if we return to New Mexico for 2016. 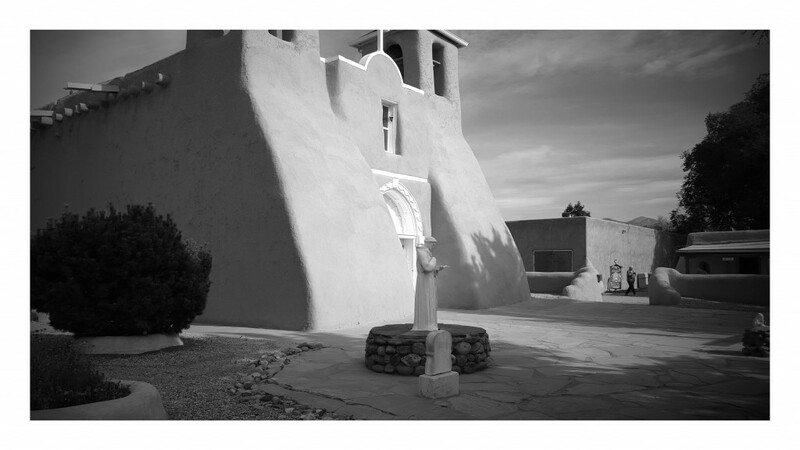 San Francisco de Asis Mission Church (Ranch de Taos) from our October 2015 trip. 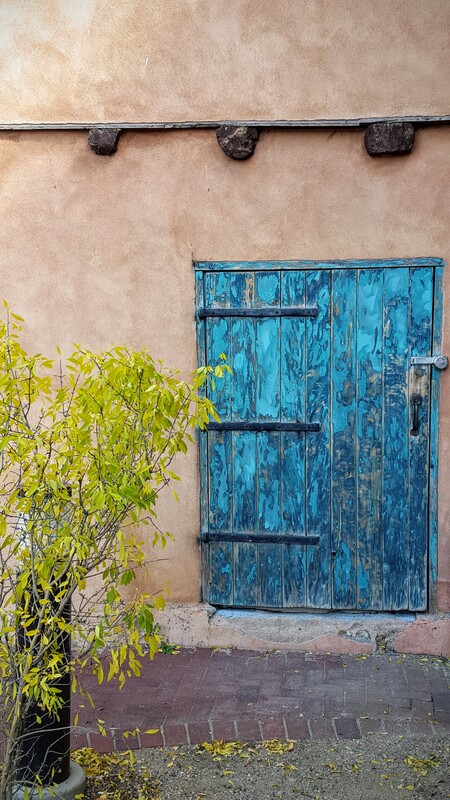 I was in a wistful state of mind last weekend and I was revisiting my posts from our Fall Break 2015 trip to Taos. On our first night in Taos, we had dined at Eske’s Brew Pub and I had a bowl of creamy vegetarian green chile stew. I promised to replicate this stew and mentioned it throughout my serial Taos 2015 posts. It’s not that I haven’t thought of this dish fondly, but where does the time go? I got close to the consistency and taste of this dish with my Green Chile and Sausage Soup; obviously, that’s not vegetarian and it didn’t have the velvety smoothness of that bowl of heaven from Eske’s. I used a number of recipes to develop this one: the aforementioned Green Chile and Sausage Soup, Vegetarian Green Chile Stew from Espanola Community Market, and New Mexico Green Chile Stew from MJ’s Kitchen. 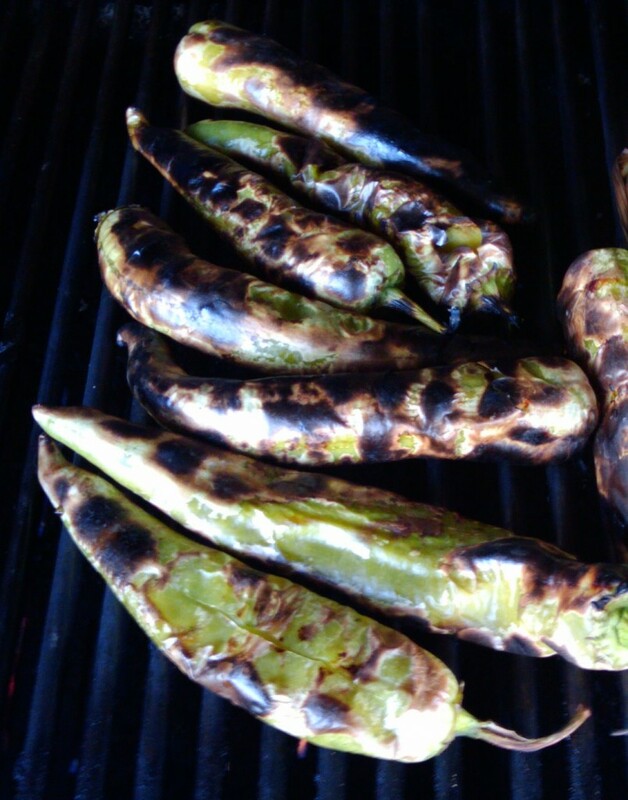 Some green chiles I roasted earlier this summer. Because that inspirational first bowl from Eske’s was a smooth concoction, I decided to entitle my recipe as a chowder. Heat a small heavy skillet over medium-high heat. Add the coriander seeds, shaking the skillet often until the seeds become aromatic and lightly brown. Let cool slightly and then transfer to spice grinder. Grind until fine. Set aside. In a large pot over medium heat, heat the olive oil and brown the onions until onions are translucent, about 5 minutes. Add the garlic and jalapeno and sauté a few minutes more. Sprinkle flour over mixture and stir to combine, cooking for about a minute. Add the tomatoes, stock, cumin, oregano, potatoes, green chiles, salt and ground coriander. Bring to a boil, reduce heat and simmer for about 1 hours. Add a little water if needed during simmering. Taste and reseason as desired. Carefully and in batches, transfer about half the mixture to a blender (or use a stick blender and puree the soup until there are a few potato chunks left). Leave it as chunky or as smooth as you desire. Ladle into bowls and top with crumbled goat cheese and serve with warmed tortillas. For a non-vegetarian bowl, you can stir in some shredded chicken or pork or add some crumbled browned sausage. I made enough for us to freeze in two portion serving containers, so I will add some variations when I pull from the freezer. While this was delicious, it was not the vivid green that I remember having in Taos. Some of my “green chiles” were actually red, so I assume that is the reason. Taste wise, though, it was spot on. Or, at least what I remember. Another trip is definitely needed!!!!! I am also linking up with Deb’s (Kahakai Kitchen) Souper Sunday. 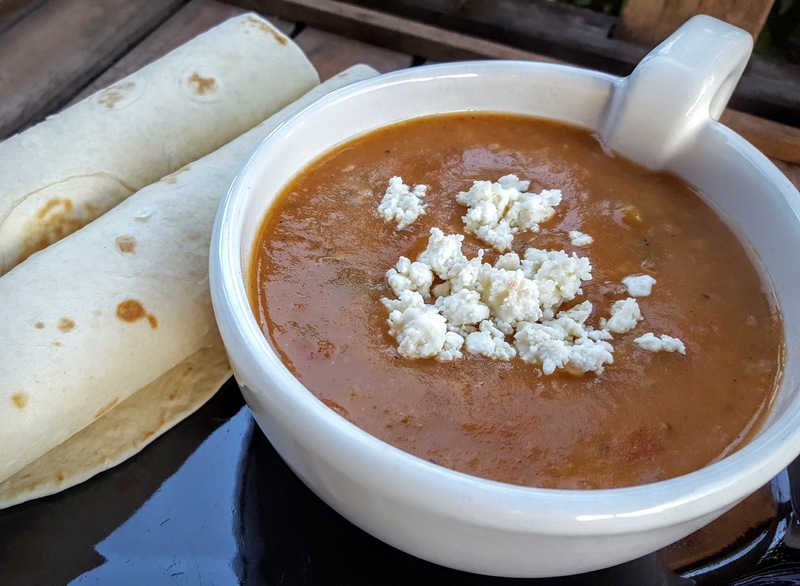 I have never had a chile chowder…it looks really smooth, cozy and delicious! Mmmmmmmm……….that looks so good and of course I too have green chilies in the freezer having already roasted and peeled them. They are waiting for cooler weather so I can make some warm comforting soup with it. This recipe will be on the list! We haven’t been to New Mexico in ages, and want to get there again. Haven’t decided when that’ll be, but I hope soon. Anyway, what a wonderful dish! 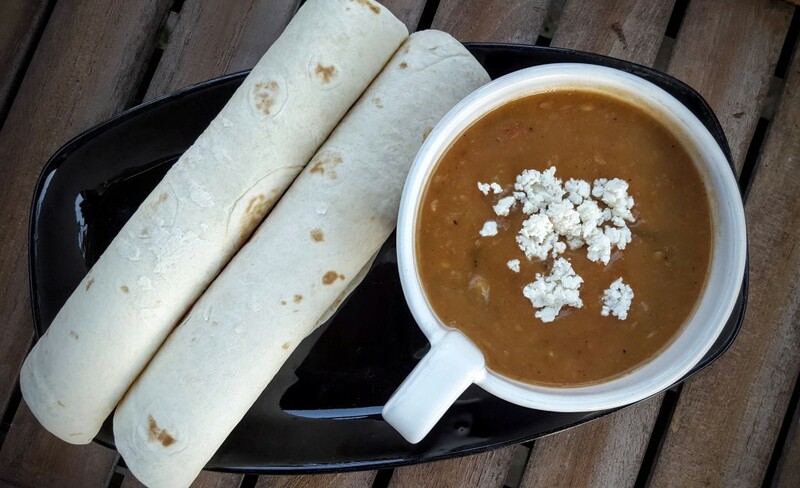 Green chile pairs well with goat cheese. Lovely flavors — thanks. Love Southwestern food and this sounds wonderful. That’s one of the joys of traveling – discovering and replicating delicious new things! Color is so important in one’s impression of food — but the flavor of your chili must be delicious, even if it’s not green. It certainly looks creamy and delicious and I especially love that tangy goat cheese on top. Yum! Oh yum…that chowder certainly sounds good.